Colleen, our blog neighbor made a wish; as this is kind of a year when wishes are fulfilled (for some at least 😉 ) I decided to add two more patterns in Christmas Ornaments group! How could I ever forget to make Mrs. Claus!? Or penguin ornament!!!??? If there is anything else I have forgotten to add, please, please let me know so we can make them in time! 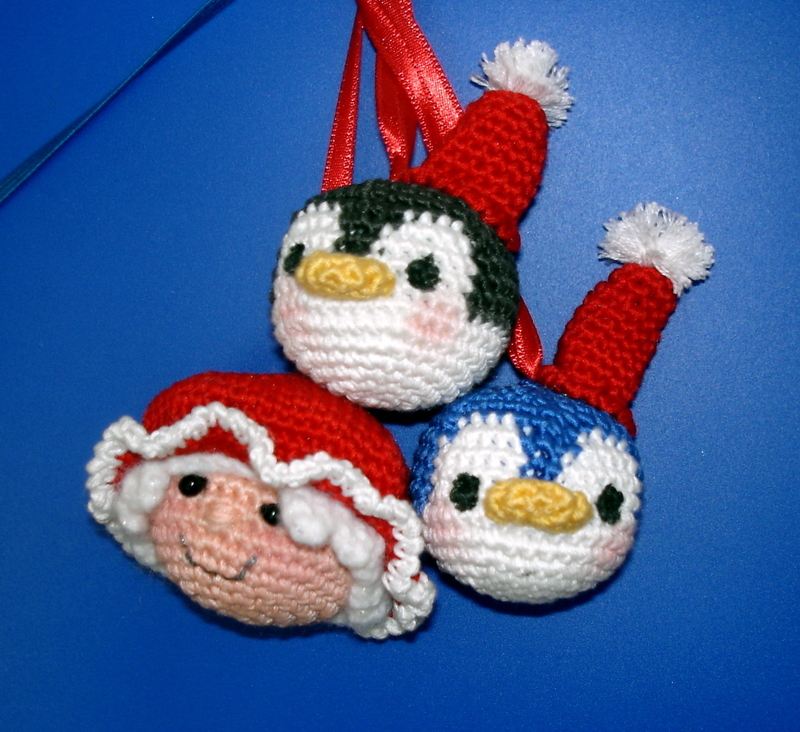 Like said, Mrs. Claus and penguin ornaments are finished and ready for you to try them out! Easy and fast as previous ones. Mrs.Claus’s head is made of two parts only. Basic head pattern and hat on which is attatche the hair as well. Make both, attatch one to another and Mrs. Claus will be done in no time. You can use safety eyes, 4-5mm beads or embroider eyes with black thread. Now add hair. We’ll add it to the hat, so once hat made, the had will be complete. When reaching first sc made earlier, slip stitch, tie off leaving long end for sewing the hat to the head. Design face as snowman, or make Mrs Clous look the way you prefer. I used same facial features as ones used for Snowmen and Santas described in Christmas Ornaments post. We will make same size basic head but this time will work in two colors. White and color of your choice for the penguin. Before we start, for those that don’t know how to change colors, let me say a word or two. Whenver I will write “change color” – will count as one sc. To change color, you will work with working color. Pull the yarn through the stitch, yarn over with the working color yarn, pull it through the loop. Having two loops on the hook! To finish the stitch, now change the color; yarn over new color yarn, and pull through both loops on the hook. Stitch is finished, yarn is changed. Tie off leaving long end for sewing (closing) the last round nicely. Hide ends. Tie off leaving long end for sewing the hat on the head (or if you prefer gluing, glue the hat on). Pompom on top of the hat. Made 1 cm wide pompom. I made mine wrapping yarn over my index finger 20 times. Cut the yarn, threaded the needle, sewed and tightened the middle of pompom. Trimmed it and made it nice and round. Sewed it on top of the hat! Tie off and sew the beak on the head, right beneath and in the middle of eye section. Place eyes (I painted mine) in the centers of white section, little bit over beak level (one row upper). Wishing you best of time making them! For any help….drop a line! Wishing you lovely end of the week and wonderful weekend to come! Previous post: Silly little Angel! Christmas is a period of family and giving. We by and large feel nostalgic at Christmas for some reasons basically because of the way the media presents Christmas to us. We feel its entitlement to have an extensive tree with extravagant embellishments, a brilliantly lit yard and delight in the time with our crew. As we are saturated with pictures of Christmas past, we are slanted to surmise that having carefully assembled Christmas adornments will make our designs all the more in keeping with the perfect.